FLEET OPTIMIZATION your next new builds, you say, ‘ok, we’ll eliminate this equip- ment because it costs more to maintain,’ ” says Wojtaszczyk. US Navy surface fl eet ships, producing a wide array of per- formance reports for a range of vessels from aircraft carriers to container ships. The predictive diagnostics capabilities of the software have proven their worth to the Navy on more than a few occasions. ESRG analytics and expert review with an in-person follow- up enabled the Navy to avoid suffering a catastrophic and ex- pensive failure during deployment. Environmental issues are big for everyone, and violations can mean stiff fi nes. Performance optimization and better equipment maintenance have trickle down impacts on envi- ronmental compliance, notes ARC’s Andy Anantharam, an independent technical consultant who owns Maritime Con- sultancy Services, Inc. “Our main focus initially was on fuel consumption. But with impending new sulphur emissions regulations, fuel cost becomes a critical operation element for us and we need to manage it as best we can. If you reduce fuel consumption, you are in turn restricting these emissions to the atmosphere and then of course, the same for carbon monoxide and green gas emissions,” he explained. Data analytics not only helps ship owners catch potential is- sues early, but data automation and ship- to-shore exchanges of data and reports enables ship offi cers to provide on the spot documentation to port and regulatory agents. 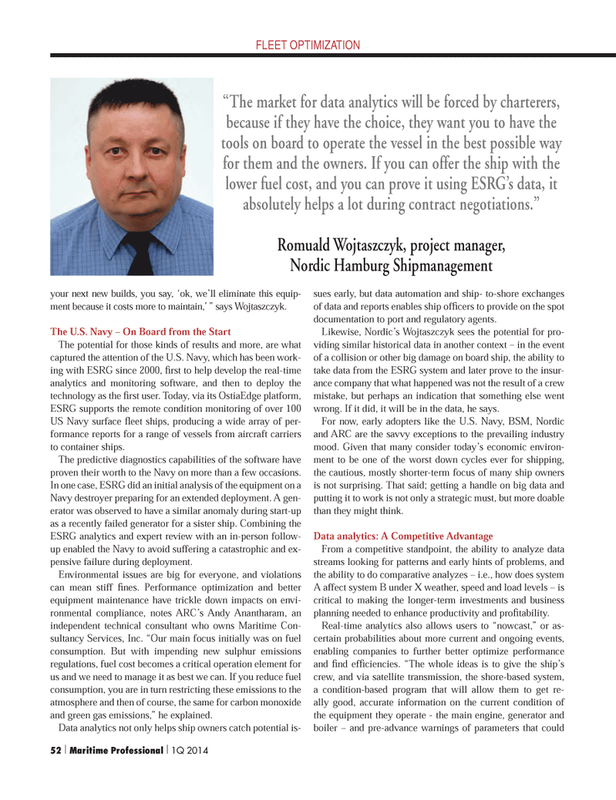 Likewise, Nordic’s Wojtaszczyk sees the potential for pro- viding similar historical data in another context – in the event of a collision or other big damage on board ship, the ability to take data from the ESRG system and later prove to the insur- ance company that what happened was not the result of a crew mistake, but perhaps an indication that something else went wrong. If it did, it will be in the data, he says. For now, early adopters like the U.S. Navy, BSM, Nordic and ARC are the savvy exceptions to the prevailing industry mood. Given that many consider today’s economic environ- ment to be one of the worst down cycles ever for shipping, the cautious, mostly shorter-term focus of many ship owners is not surprising. That said; getting a handle on big data and putting it to work is not only a strategic must, but more doable than they might think. A affect system B under X weather, speed and load levels – is critical to making the longer-term investments and business planning needed to enhance productivity and profi tability.